The parent company of Burger King is trying to turn Canadian icon Tim Hortons into a global brand. However, sales in Canada are dropping — and franchisees say that the chain is losing its national identity. On Wednesday, Restaurant Brands International — the parent company of Burger King, Tim Hortons, and Popeyes — reported that Tim Hortons’ Canadian sales fell 0.6% in the most recent quarter. The is the second quarter of negative sales at the chain, and the fifth quarter in a row of declining same-store sales. The sales slump comes on the heels of news that a group of Canadian Tim Hortons franchisees filed a class-action suit against the company in June, claiming that Restaurant Brands had failed its obligations to local operators. Restaurant Brands CEO Daniel Schwartz said that the company did not want to speculate on the sales impact of “any of that,” after an analyst asked if publicity from the franchisee dispute could be impacting Tim Hortons’ Canadian sales. Restaurant Brands executives attributed the sales decline to promotions that failed to catch on, compared to last year’s popular deals and new menu items. “Our focus, our strategy of delivering a great guest experience and working collaboratively with our restaurant owners… none of that changes based on this other stuff,” Schwartz said. 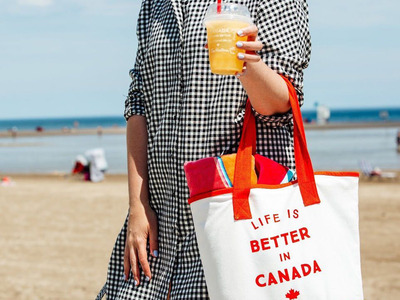 In July, Bloomberg reported that many Tim Hortons’ franchisees felt that Restaurant Brands had turned locations into “profit centres,” cutting local marketing that would typically be used to fund community hockey programs, camps for kids, and barbecues. Franchisees also told Bloomberg they were unhappy that they had been forced to raise menu prices, due to the higher costs of supplies sold by Restaurant Brands. On Wednesday, at least some Tim Hortons Canadian locations announced new price increases, according to Nomura analyst Mark Kalinowski. While Restaurant Brands did not directly comment on the lawsuit or franchisee complaints, executives heavily emphasised the company’s dedication to Canada. “Both our strong Canadian heritage and our community involvement are two of the most important attributes of Tim Hortons,” Schwartz said. In late June, Tim Hortons launched a Canadian-centric marketing campaign to celebrate the country’s 150th anniversary, serving poutine doughnuts and debuting cups covered with Canadian iconography. Schwartz also highlighted that the chain’s “Camp Day” raised $US13.7 million this year to send low-income kids to camp. On Wednesday, the company announced it had signed an agreement to open Tim Hortons locations in Spain. Restaurant Brands has already announced similar agreements to expand the chain in Mexico, Great Britain and the Philippines. PSA: Tim Hortons price increase starts td! Plz remember employees arent responsible for it, plz dont take it out on us. We just work there!